The Le Sigh: Stream: Father Truck - "Hot Moth" / "Big Destiny"
Stream: Father Truck - "Hot Moth" / "Big Destiny"
Listen to two new songs from Father Truck's upcoming debut. 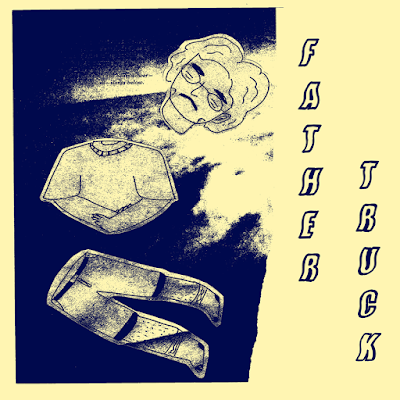 In July of 2015, Father Truck posted their first mini EP (it's barely two minutes long) on bandcamp with the description, "I don't know what I'm doing." This subtle self-deprecation is common among artists who fall into the bedroom pop genre. Often, their initial musical output can be their first time experimenting with an instrument in the safety of their own room. But their relative inexperience by no means indicates a lack of quality or talent. Even with Father Truck, who is actually Brooke Johnson of Grand Rapids, showed early promise in their first pluckings of guitar that has only grown over time. On a later album from last spring, Johnson updated the description with, "I don't know if I'll ever make long enough songs for a full length." Apparently this has changed, as Father Truck will be making their official debut this April. Johnson's next album, Stealing Flowers From the Neighbors Lawn, will be released next month on It Takes Time Records, but you can hear two songs from it today. On both "Hot Moth" and "Big Destiny," Johnson sticks to a single instrument that they introduced midway through their discography - a keyboard. Johnson honestly explores gender identity over the warbling synths, offering a message of finding solace and strength in unlikely places (for them, it was through Adventure Time). The combination of stripped down keyboard and the manipulation of Johnson's voice is all at once gently heartbreaking and optimistic. Hopefully, Father Truck will finally be convinced that they know what they're doing, since we certainly know that they do. "these songs are a reflection into how i’ve been feeling about my confidence with my identity, specifically after watching the new mini series islands from adventure time. i was using that as a way to cope with finally being comfortable in my own skin and learning to love myself. in my song 'hot moth' i’m looking into the mirror and i see a big beautiful man- which is in reference to the robot BMO when he said 'i’m a big beautiful man here' which i’m like, hey, i can be that big beautiful man too and i can do anything and i’m not afraid anymore"
Listen to Father Truck on bandcamp.